Herod Archelaus (4BC-6AD) was the oldest son of Herod I the Great and his Samaritan wife Malthace. Herod at first designated his heirs were to be Aristobulus and Alexander, his sons by the Hasmonean princess Mariamne. It was only after they were executed (c. 7 BC), and Herod’s oldest son Antipater was convicted of trying to poison his father (5 BC), that the now the elderly Herod turned to his youngest son Herod Antipas (4BC-40AD). During his illness in 4 BC, Herod had yet another change of heart about the succession and turned instead to Antipas’ elder brother Herod Archelaus was now to become king of Judea, Idumea, and Samaria. Antipas would rule Galilee and Perea with the lesser title of tetrarch. Herod Philip was given Gaulanitis (the Golan Heights), Batanaea (southern Syria), Trachonitis and Auranitis (Hauran). 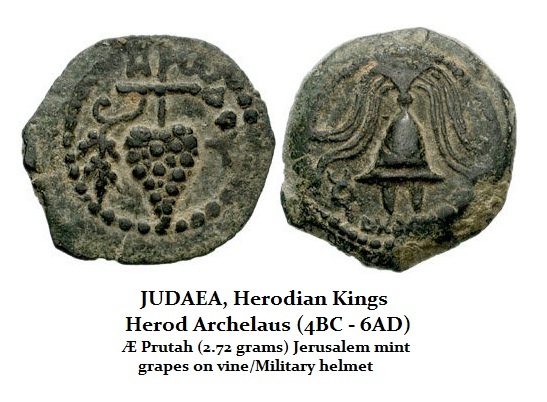 Because of Judea’s status as a Roman client kingdom, Herod’s plans for the succession had to be ratified by the Roman Emperor Augustus (27BC-14AD). The three heirs, therefore, traveled to Rome to make their claims, Antipas argued that he should inherit the entire kingdom. His brothers argued that their father’s will ought to be honored. Despite qualified support for Antipas from Herodian family members in Rome, who favoured direct Roman rule of Judea but considered Antipas preferable to his brother, Augustus largely confirmed the division of territory set out by Herod in his final will. Archelaus had, however, to be content with the title of ethnarch rather than that of a king. Then in 6AD, Archelaus was deemed incompetent by Augustus and he was replaced with a Roman prefect. As a result, Antipas would govern Galilee and Perea for the next forty-two years.